June 16, 2015 (LBO) – Sri Lanka’s Power Minister is currently paying almost double for the purchase of coal at current world prices, Western Provincial Councilor Udaya Gammanpila charged. 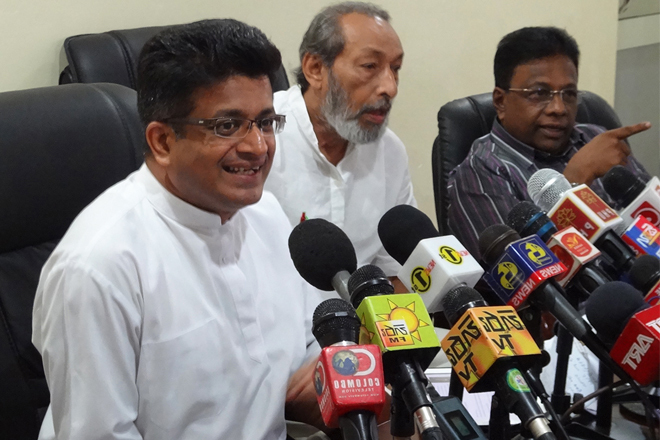 Gammanpila, who broke away from the JHU at the last Presidential election, accuses his former ally Champika Ranawaka for intervening an alleged tender deal saying it is a mega deal. According to Gammanpila, eight companies have forwarded their bids for a tender called for the purchase of 675,000 metric tons of coal on 08 April 2015. Gammanpila says it is illegal to violate tender procedure by seeking cabinet approval for rejected tenders. According to Gammanpila, there is only one supplier who supplies coal to the CEB since 2010. Gammanpila emphasized that the prices of coal has come down by almost half against 2010. “May be the Minister is trying to get coal from the existing supplier paying twice the price. Either way this is a mega deal.” Gammanpila stressed.